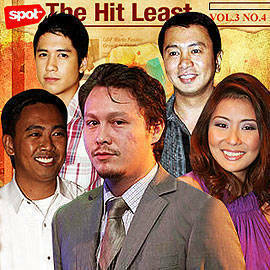 Plus, Raymond and Heart make peace, <em>Machete</em> airs first episode, and more lowlights. 2. MACHETE AIRS ITS PILOT EPISODE. The best way to watch this show: Hit the mute button and just zero in on Aljur Abrenica’s abs. 3. TRAFFIC ENFORCERS CATCH 63 BAD DRIVERS AND 50 JAYWALKERS ON THE ACCIDENT-PRONE COMMONWEALTH AVENUE. Sometimes death is the most effective teacher. 4. INFORMAL SETTLERS GO UP AGAINST THE POLICE IN SAN JUAN. Informal settlers will be using this video clip as their Face to Face audition piece. 5. GOV’T AND CHURCH AGREE OVER RESPONSIBLE PARENTHOOD BILL, WHICH DITCHES CONDOMS AND OTHER "UNHOLY" CONTRACEPTIVES. The Church scores..and the crowd goes wild! 6. RAYMOND GUTIERREZ AND HEART EVANGELISTA MAKE PEACE. That’s right, kids, bury the hatchet...just not on each other’s backs. 7. A 1994 MODEL FX IS CARJACKED. Either the carjacker was an idiot or that must have been one good-looking FX. 8. MAYOR JUNJUN BINAY ENSURES THE MAKATI BUSINESS COMMUNITY THAT EVERYTHING IS JUST FINE. Just don’t mind the occasional bus explosions, gas leaks, mall blasts, and coup d’etat attempts. 9. REP. RONALD SINGSON ADMITS THAT HE USED DRUGS, BUT SAYS HE’S NOT A DRUG TRAFFICKER. This admission gives us so much comfort. 10. BARON GEISLER GOES TO REHAB. When he leaves, they’ll say, "Thank you, sir, come again."